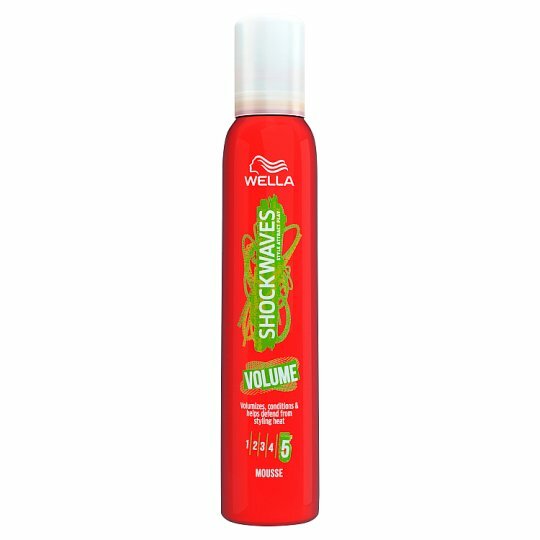 Shockwaves Volume Mousse 200ml is a crucial part of any complex hairstyle and ensures that your hair has certain volume and grace. For a flexible and touchable hairstyle that lasts up to 24 hours use Shockwaves Volume Mousse. Perfectly boosts your volume and conditions your hair while maintaining a long lasting hold. Our volume mousse protects your hairstyle from humidity and UV rays while providing that smooth, non-sticky feel. Shockwaves Volume mousse helps to defend from styling heat, leaving your hair looking great and ready for a style fix of your choice. Wella Shockwaves, style the moment, your style, your moment, your way. Blow-dry with thick-round brush or with head upside down.